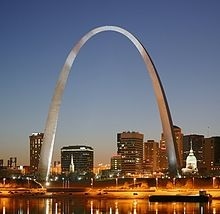 The Gateway Arch dominates the St.Louis riverfront. With all the off-budget, independent, quasi-governing bodies in New Orleans, is it any wonder the city must turn to huge fee hikes to support basic services like sewerage and water? The final plan would have authorized special tax districts around the city, not just for the World Trade Center.